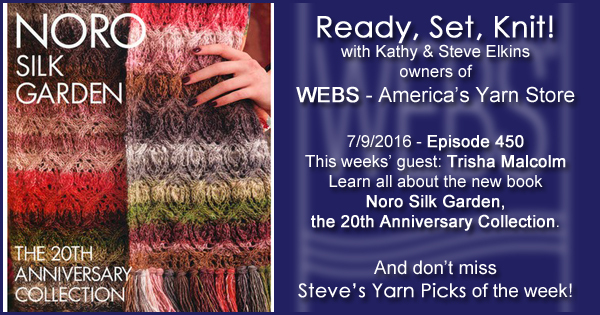 This week Kathy talks with Trisha about the newest book from Soho, Noro Silk Garden, the 20th Anniversary Collection. This book contains a beautiful forward by Mr. Noro about the importance of silk in Japan and the creation of this iconic yarn, as well as 30 patterns in Silk Garden, Silk Garden Lite, Silk Garden Sock and Silk Garden Solo. Flashsale – An additional 20% off all Closeouts and Grandpa’s Garage Sale yarns Sunday and Monday ONLY! Check the site and stop by the store. Welcoming the Stranger: Building Understanding through Community Based Art. Kathy interviewed the founder, Jo Israelson, last year, listen now. Join us for our Spinshops on July 17th 10-4, sign up now! 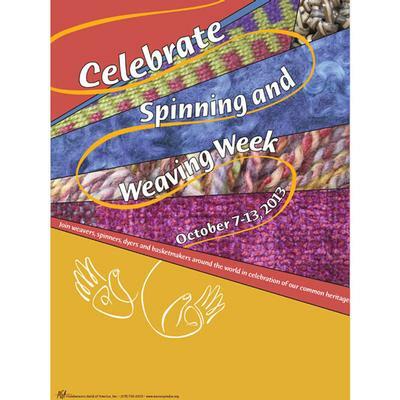 This week Kathy talks with WEBS Store Manager Leslie Ann Bestor about the upcoming National Spinning and Weaving Week. Wednesday is the Big Meet-up day from 10-3:30pm! Come on in and spin or weave and bring show and tell projects. We’ll have snacks and lots of fun! There will also be special deals and sales on select weaving/spinning tools and supplies – in store only. Remember the mini workshops are only $5.00 and you must pre-register. The Cover Sweater from our Fall 2013 Catalog has been hugely popular and has cleared out ALL stock of the yarn available in the US! WOW! Noro has actually put this one yarn color at the top of their production list because of your demand! and new shipments of Obi color #05 should be in stock by mid-November. If you don’t mind the wait, feel free to place an order for this color that will remain on back order until it is restocked, or check out some of the other color selections in the Obi yarn. If you’re posting about your progress on Facebook or Twitter please use #PodcastThrowdown. 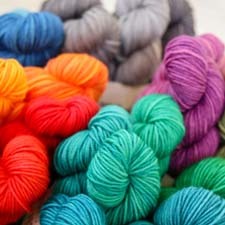 And please join the Podcasters Throwdown Group on Ravelry and show your support in the Team RSK thread! Our 10th Annual Knit & Crochet for the Cure event is happening in store October 6 from 1-4pm. Please register! WEBS is open regular hours on Columbus day weekend, closed on Sunday and open on Monday, while you’re here you should check out the Paradise City Arts Festival Oct 12-14 at the 3-County Fairgrounds. Registration is open for our 7th Annual Bus Trip to the NY Sheep & Wool Festival in Rhinebeck on October 19th! Are you on the bus? 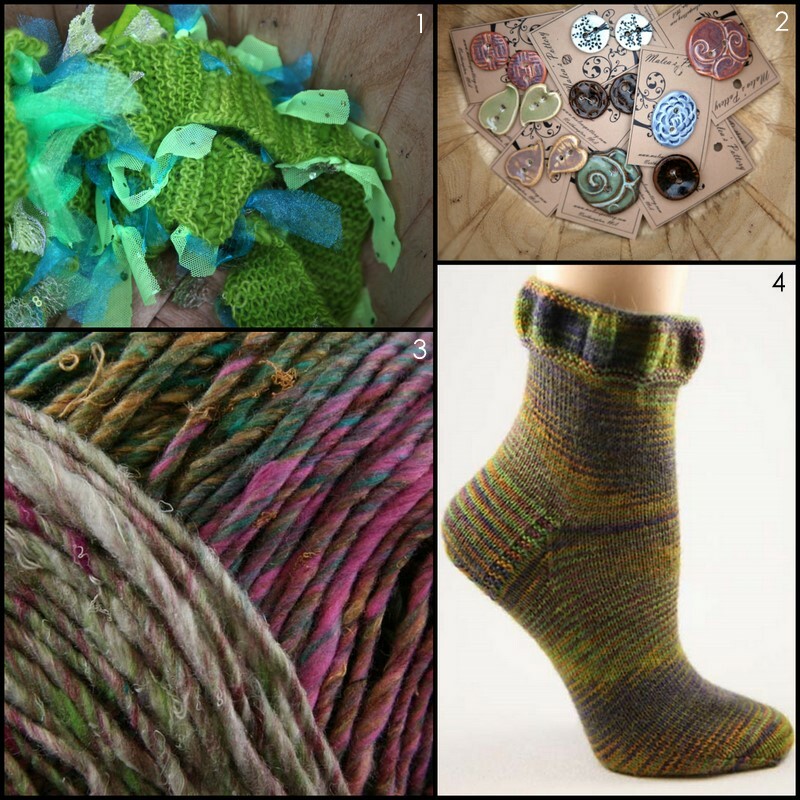 Guest: Beth Casey of Lorna’s Laces chats with Kathy about the newest yarn from Lorna’s Laces – Solemate. This is a sockweight yarn that’s a blend of superwash merino, nylon, and Outlast. Outlast is a technological fiber that helps regulate your temperature – cools when it’s too hot and warms when it’s too cool. The yarn has a very high twist, similar to the Shepherd Sock because it’s such a well-wearing, popular yarn. There is some springiness in the new yarn, but it is a little bit smoother because of the content. Beth also talks about the newest colors named after iconic Chicago landmarks. Check out the Lorna’s Laces blog. Our next Crochet-a-long is Valley Yarns #414 Valley Cowl. This cowl was designed by Doris Chan and is written to be crocheted in nearly any of the Valley Yarns! 1. 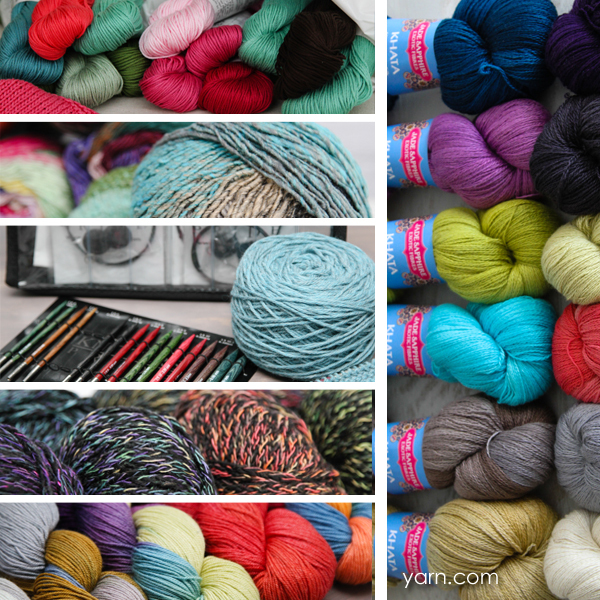 Pagewood Farm Glitterati is a new yarn with a lot of personality! It may be a bit over the top for some, but I love the colors and all the ribbon & sparkle! > Kathy E.
2. Buttons by Malea’s Pottery – Our Office Manager, Malea, makes these wonderful hand made porcelain buttons that are available in the store. They range from $6-$14 a card which is super affordable for hand made buttons and they have the most beautiful craftsmanship. As with all of the buttons we carry, these are only available in the store and not on our website. 3. Noro Aya – I like the soft, summery fiber content, and deals on new Noro yarns don’t happen every day. I’m stashing a bag of color 5 for a simple all-seasons cardi. > Kirsten H.
4. Valley Yarns Ruffled Socks – I know it’s my pattern, but I have to buzz about the Valley Yarns Ruffled Socks. I’m so excited to have finally finished my own pair so I can wear them…except it’s now June. I’m glad I discovered this heel technique (found in the Encyclopedia of Needlework) because I think it will be my stand-by for all my future socks. It was lots of fun to design and knit. Kristin L.